ACW’s Vintage Cradle Frame Stripping Guide. The cradle frame is a more traditional frame design, having “pinched” wings that are reminiscent of the wings on a low frame, yet retaining the upright characteristics of the medium frame. This is a distinctly “vintage” looking frame, making it ideal for restorations or reproductions where this older aesthetic is desired, however some “modernist” bamboo and graphite rodmakers simply prefer this frame style and use them on otherwise contemporary rods. In the 10mm size, approximately 1.175” long and 0.555” tall from the bottom of the feet to the top of the ring. 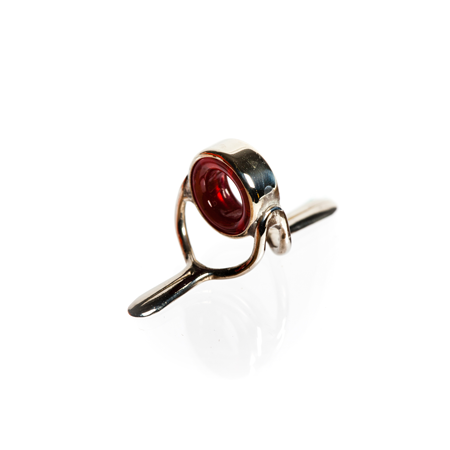 Vintage, Pre-WWII Red Rings 10mm and 14mm – a mix of agate and agatine, no material choice.